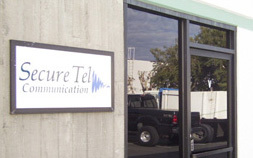 To contact Secure-Tel Communications please call us or e-mail the appropriate department below. Click the link below for a map and driving directions to Secure-Tel Communications. To contact us please put you name, company email address of the department your wishing to contact your phone number and any questions comments or concerns. Copyright Secure-Tel Communications Inc. All rights reserved.